I know that I’m going to talk about a vegetable here and not my usual lusting after a dessert, but man do I ever love a couple of pickled carrots to snack on! These are great to can before the fall and snack on allll winter long! Yes, it’s still me, I’m writing this post and no, I haven’t lost my mind. I’m waxing poetic about a vegetable and to be honest the carrot is not one of my favorite ones.Carrots to me are only eaten for the nutritional benefits during the winter as the taste pales in comparison to the carrots pulled straight from the sun heated ground during the harvest time of year. I eat them because they are a vehicle to get hummus or guacamole into my belly and not feel guilty about it. Indeed, those times that I eat 300 calories of hummus in one sitting, I’m most likely patting myself on the back that I ate carrots with it. Pickled carrots are another kettle of fish entirely. 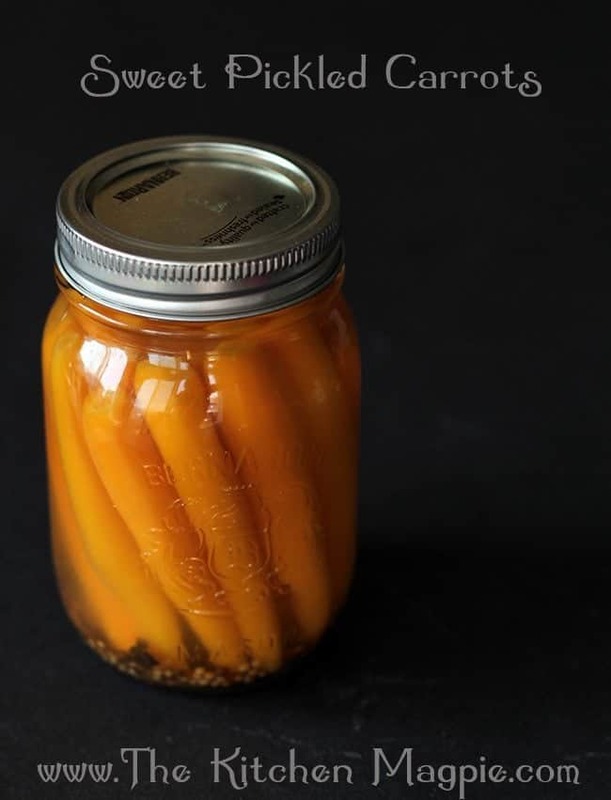 Not just for fancy garnishes in restaurants nowadays, the pickled carrot has now found it’s way to the canner’s cupboard and local farmer’s markets….and into my belly. Without 300 calories worth of hummus. 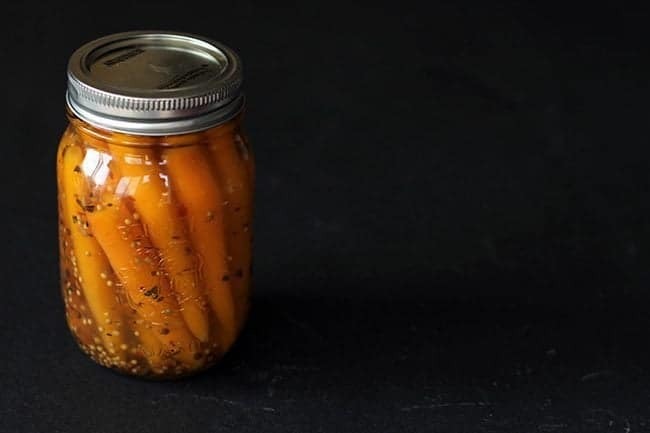 When I decided that I was going to make pickled carrots at home I knew that I wanted sweet and spicy ones, not spicy as in heat but spices that knock your socks off with flavor. Pickling spice is perfect for this very reason, the flavors match vegetables that are delightful when the sweet tang of a sugared brine is added to them. Carrots are a great vegetable to match with a sugary brine, being on the sweeter side themselves – and I’m talking about those garden fresh carrots, not the supermarket variety.Those fresh garden beauties are the jewels that you want to preserve for the winter months. The recipe is taken straight from the National Centre for Home Food Preservation, as it’s a non-acidic food that we are canning. Remember, do not change anything about the recipe, I have switched out the spices but do NOT change the vinegar ratio, process times or the steps! i question your nutritional value calculations. 557 calories for 4 grams ? and 58% of the daily dose of sodium ? not very healthy. Hi Sandra, the calculate includes the juice which you won’t eat, however I would be remiss only giving the info for the carrots. Can I do this in quarts? I’m running out of pint jars. And if my 5yr old eats these like he does pickles then no sense in doing pints. But need to know the right processing time. Thanks. Recipe sounds so great, just curious though do these pickled carrots still have “crunch” being cooked for 10 then canned for 20 (in my case). Thanks! @Tanya I was wondering the same thing. Did you find out? HI: Going to try this recipe. Got a kick out of your profile “I bake, cook, homeschool my two children” Reads as if you bake and cook your children. LOL Might try rewriting that line.